Based on fundamental university research and confirmed by EMG measurements. Your hand, thumb and fingers are supported in the best, relaxed position. There is no friction between the skin of your hand and the desktop. Intensive working with a conventional computer mouse may result in complaints like tingling, pain and /or obstruction of the blood flow to and from your arms and hands. Another symptom is a restricted rotation of the head. However excellent the functionality of the standard computer mouse - we all use it with great ease - most of the time it is too small for the hand while its shape forces your hand and fingers in an unnatural gripping position. It lacks comfort. Therefore a group of mechanical engineers, working in close co-operation with the Medical Center of Erasmus University in the Netherlands, have re-designed the mouse, and invented the ergonomic mouse called the Handshoe Mouse. To maximize the advantages of this mouse and experience maximum comfort, a correct fit is required. Therefore the hand has to be measured. 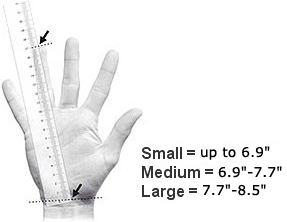 Measure on the inside of the stretched out hand. The distance from your wrist (the cross over between hand and arm) up to the tip of the ring finger. This length provides an indication of the required size. This innovative, patented, truly ergonomic computer mouse, has been field tested in large organizations for almost two years and has shown to reduce the complaints as well as the risk of Repetitive Strain Injury (RSI), Carpal Tunnel Syndrome and other Neck, Shoulder, Arms and Hands (NSAH) complaints. Instead of over-using your hand and wrist, your arm will most of the time let the optical Handshoe Mouse float without any effort. The shape allows for the hand to continuously rest on the mouse body in a relaxed fashion, so there is no skin contact between your hand and the desk. As a result there is no skin irritation as caused by excessive rubbing when moving a conventional mouse. 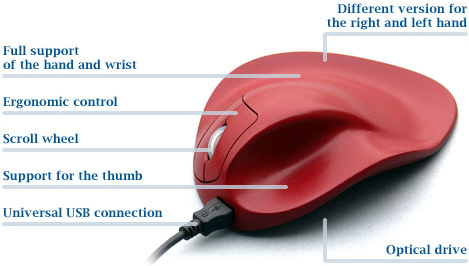 Contrary to conventional computer mice you don`t have to continuously lift (hover) the fingers, to prevent accidental switching. The buttons of this ergonomic mouse are positioned in line with the fingers. Only minor pressure is required to click the buttons. The thumb rest of the HandShoe Mouse allows for a relaxed position and prevents excessive thumb action which can be harmful. In Dutch the word HandShoe means "Glove". The Handshoe Mouse "fits like a glove" or, like some people say "feels like a saddle for the hand". The HandShoe Mouse is available in three standard sizes (Small, Medium and Large) which are available in a wireless and a wired version. So there is a Handshoe Mouse for everyone! The user friendly HandShoe Mouse is an ergonomic mouse available in 3 standard sizes for the right hand: small, medium and large. On special request left hand versions and extra small versions for the right and left hand can also be produced. 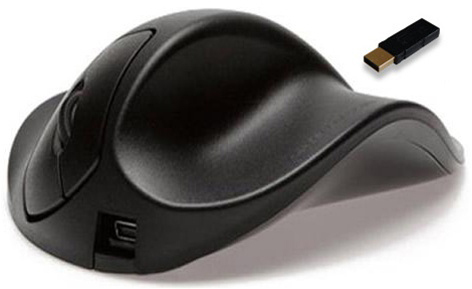 The HandShoe Mouse is plug and play, no special drivers for Mac or PC are needed. Controls consist of 2 buttons at an ergonomic position and a scroll wheel fitted with a switch mechanism. The large size HandShoe Mouse has a third switch button. This switch button is not programmable; it has the same function as the click function underneath the scroll wheel. From now on you can also order a BlueRay Track (BRT) version of the HandShoe Mouse which will work on almost every surface. The BRT version works with a higher resolution than the standard: 1000 dpi. Poll rate (Hertz) of the electronics is 113~118Hz and up to 120Hz. Wireless range of the receiver is 10 m.
Receiver / dongle is fitted with a LED light which goes on and off when operating the mouse. The wireless HandShoeMouse uses a lithium ion battery which can only be removed by professional service providers. Battery life is around 2 years. Operating time for the wireless version is around 4 weeks. Charging of the wireless version takes around 3 hours. Charging takes place by means of USB cable; The PC or laptop needs to be switched on during charging. One can continue working while charging the battery; the micro receiver / dongle must be in place. •	The wireless HandShoe Mouse uses a lithium ion battery which can only be removed by professional service providers. •	Battery life is around 2 years. •	Operating time for the wireless version is around 4 weeks. •	Charging of the wireless version takes around 3 hours. •	Charging takes place by means of USB cable; The PC or laptop needs to be switched on during charging. •	One can continue working while charging the battery; the micro receiver / dongle must be in place. Question: Do you recommend a special pad for this mouse? Something like a WOW pad? Answer: No specific mouse pad is recommended for this mouse. You can use any mouse pad. No question, just wanted to let you know how pleased I am with this mouse. I had proximal row carpectomy surgery done on my wrist in August 2018. Using this mouse significantly reduced the problems of strain and fatigue I was experiencing, both with wrist and arm. My employer purchased a mouse from your company and I am very thankful! I would highly recommend using the mouse! I also found the key is to let my arm relax and lay flat. 1 of 2 voted this review as helpful Was this review helpful to you?